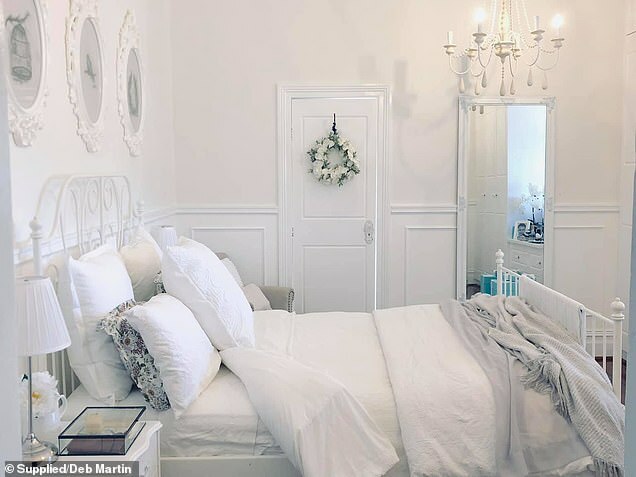 A makeup artist from Western Australia has revealed how she transformed a run-down bedroom into a beautiful white airy space for just under $1,000. 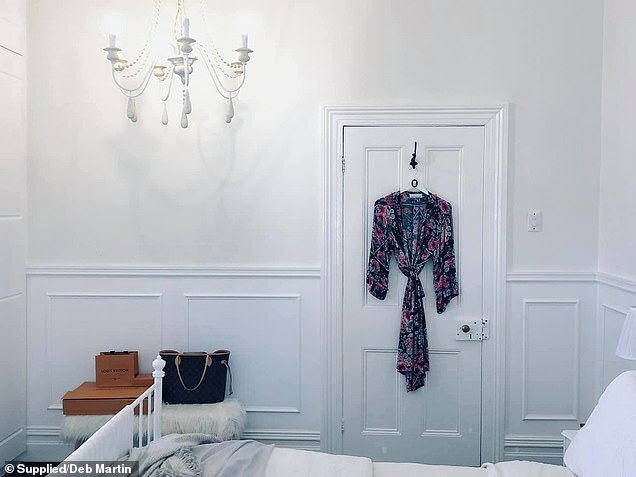 Deb Martin and her partner Cameron renovated their master bedroom over the past few months - and turned the ramshackle room into a hotel-worthy modern space. So how did Deb and Cameron transform the bedroom? 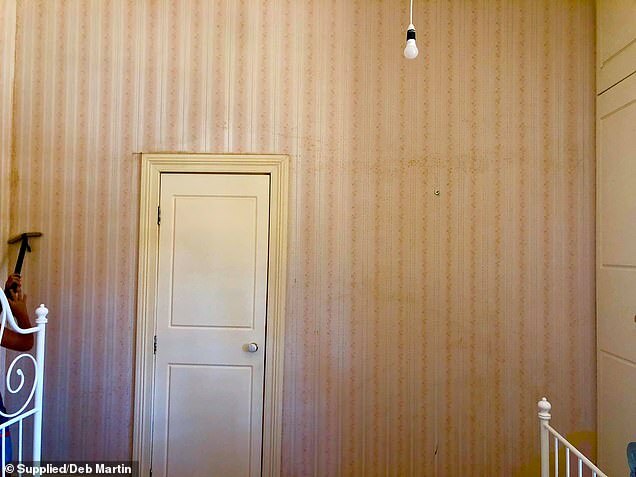 'We started by hiring a wallpaper steamer to strip the mouldy old wallpaper off,' she said. 'This was the only thing that was outsourced, the rest we did ourselves. Next, we sanded all the walls, in preparation for painting and wainscoting [panelling applied to walls]. 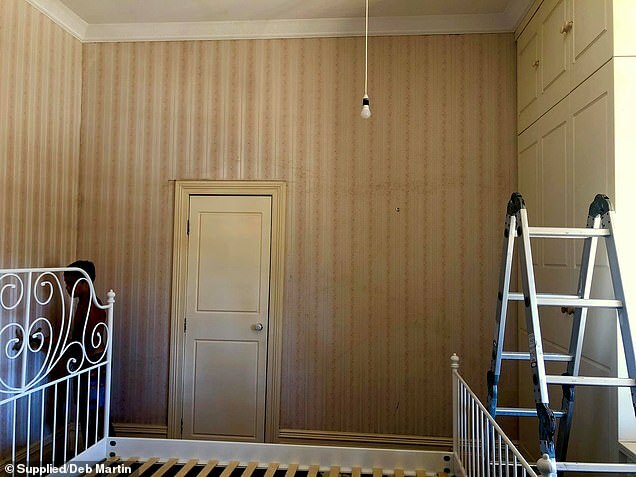 Following this, the savvy couple painted both the ceiling and the walls. They also painted their wardrobes white to keep with their overall theme. 'We bought an IKEA bed and two side tables off Gumtree,' Deb said. 'Then we painted them white and bought two $10 curtains from Spotlight on sale. Finally, we bought three cheap IKEA picture frames to go above the bed and I painted some pictures to go inside them. Speaking about her tips for general home renovations, Deb said it's all about reusing what you can. What are Deb Martin's tips for renovating? * Recycle and upcycle old furniture. DIY and do painting yourself. * Pick a theme and stick with it. * Refer back to your photo file of screenshots throughout a renovation. * Use Instagram for inspiration. * Stick to a budget. Remember what it is and apply it to everything you buy. * Have fun with renovating. It doesn't have to be a chore all of the time. The 41-year-old makeup artist also said it's important to pick a theme and stick to it. Deb said it's important to have a 'photo file of screenshots to refer back to and use Instagram for inspiration'. 'There are so many creative people and you can use them to inspire your creativity,' she said. Finally, she said a budget is paramount. 'My tips for others is that you need to have a budget and stick to it. Also, keep your theme in mind throughout the renovation and have fun with it,' she said. This isn't the first room that Deb has transformed. After purchasing a 1900 stone cottage with a 'terrible 70s add on' in Geraldton in July 2017, Deb and Cameron have slowly and steadily transformed it room by room. 'We've been renovating each room and now love our new laundry. We tried to keep it true to the period of the cottage instead of the 70s shamozzle [sic] that it was,' Deb said. To follow Deb Martin's renovation journey on Instagram, please click here.